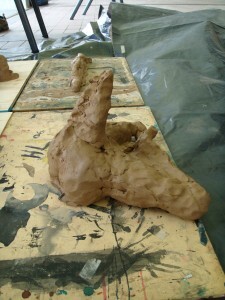 Working with clay – what a treat! I absolutely loved it. I felt like Auguste Rodin, shaping human form out of a lump of clay, so malleable, yet requiring physical force, an engagement of the whole body not just the hands. Imagining the flesh, the volume, the density, the boniness, the receptivity to touch. 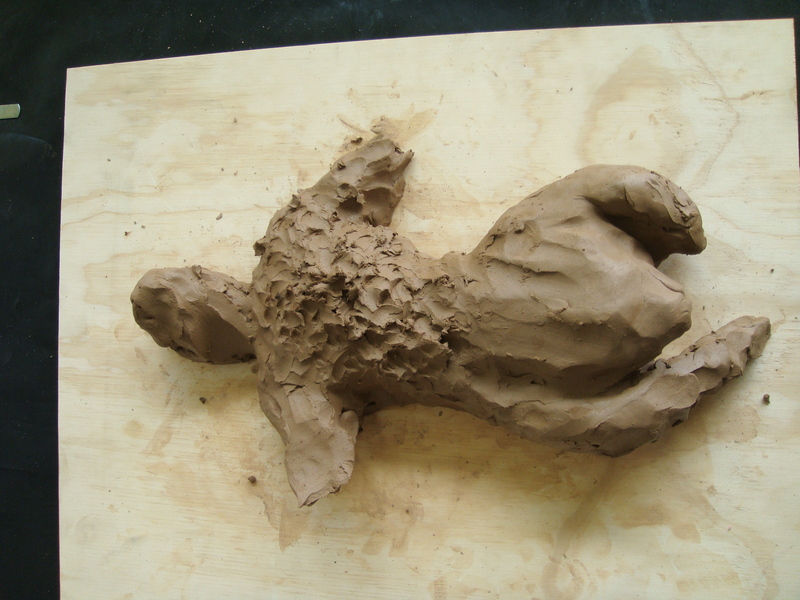 In the first session Catherine asked us to sculpt a body out of clay. In the second session we sculpted our own body while blindfolded. The body was to assume a posture or gesture familiar to us. In between these two sessions, Catherine lead us on a Feldenkrais exercise working with tilting the pelvis, articulating the spine and rotating the entire arm from the shoulder. At the beginning of the exercise, she asked us to register where the act of sculpting still resonated in the body. For me, I felt a glow in my abdomen, lower arms and hands. The first clay sculpture had an almost chicken-like lower half, swollen abdomen, drumstick thighs. The chest was like heavily whipped water, almost ravaged. I wanted to show the intensity of emotion experienced in this part of the body. The clay allowed a easy translation of the dynamic, emotive qualities of human experience. I felt a freedom being blindfolded, not caring so much about getting the visual form “right”. The pleasure in the body moving and making, feeling and stroking the clay, came to the foreground. I sculpted standing up, feeling the force of the earth under my feet feeding through my body and hands into the clay. I took heed of Catherine’s reminders about taking care of my body in the act of making … where was I holding tension, where did it hurt … shifting to a new position. I notice my sculptures were both incomplete forms, offering suggestions, ambiguity in interpretation.